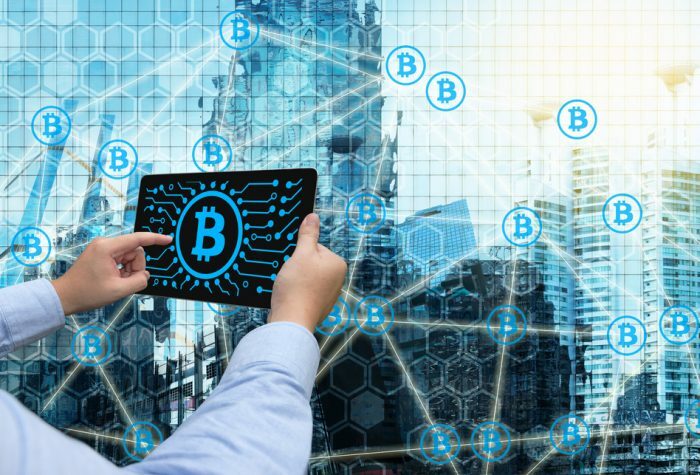 Blockchain will undoubtedly have an impact on the financial services industry and a big question today is how Blockchain will disrupt banking. Will Blockchain do for banking (and transactional services in general) what the internet did for media? How will banking evolve as Blockchain matures and continues to gain traction in the marketplace? Blockchain sounds complicated but at its most basic level, it’s fairly simple: Combing shared databases and cryptography, Blockchain technology allows multiple parties to have simultaneous access to a constantly updated digital ledger that cannot be altered. It’s easy to get enthusiastic over the potential for Blockchain to revolutionize the keeping of ledgers and the storing and disseminating of transactional data. The promise and potential are definitely there. Banks are putting big money into exploring and developing Blockchain-related services. According to KPMG’s Pulse of Fintech report, Blockchain firms raised more than $240m of venture capital money in the first six months of 2017, much of it from banks. While the real impact is yet to unfold, banks are betting big on the potential for this technology to really shake things up. Banking is an industry ripe for Blockchain-related disruption. Our reliance on what is really a dated financial system that is largely dependent on paper makes it not only more expensive and inefficient, but also makes the system an easy target for fraud and crime. The distributed, trustless nature of Blockchain adds great efficiencies and also disrupts the potential for fraud. 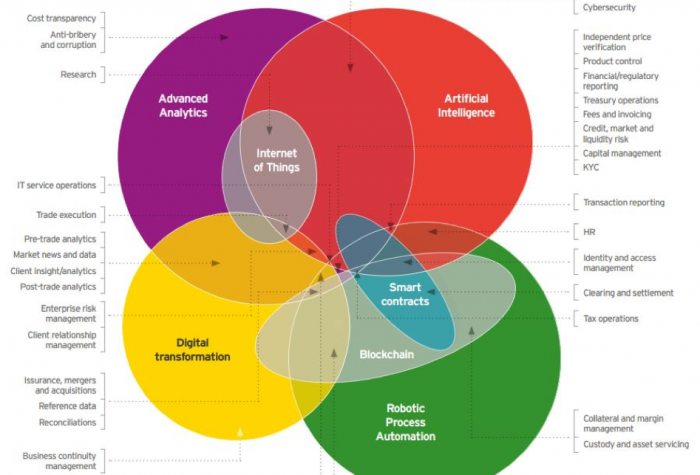 As shown above, Blockchain is at the intersection of many, many interrelated technological shifts that are happening now in real time. Blockchain will undoubtedly have an effect on virtually every aspect of the financial system. As it relates to banking and the disruption we can expect to see happening, let’s take a closer look at payment, clearing, and settlement systems, as well as loans and credit. Payment – Wire and transfer fees can be both expensive and time-consuming, and sending payments across borders becomes even more complex due to the exchange rate and other hidden fees involved. Cryptocurrencies like Bitcoin offer an easy solution, affording access to financial services to millions around the globe who might not otherwise have it. Clearing and Settlement – The process of recording loans and securities has been fairly Byzantine to this point—complicated, inefficient, and slow. Currently a standard bank transfer using Society for Worldwide Interbank Financial Communication (SWIFT) protocols takes several days to settle. With Blockchain settlement, can happen instantaneously. Banks estimate that nearly 20B could be saved using Blockchain technologies for clearance and settlement. Loans and Credit – In today’s world, securing a mortgage can take at least 30 days and usually 45 to 60 days. Imagine securing that loan instantaneously. We’re not there yet, but with Blockchain, the gatekeepers are not needed. Credit history, income and assets could all be assessed in a trustless, verified transaction, with no underwriters needed. Blockchain applications for the loan and credit arena are still in their infancy, but the potential for disruption is palpable. Consumers would gladly trade in the arduous process of mortgage loan qualification for a quick yes or no. If Blockchain can deliver on that, the effects would ripple through banking, mortgage lending, and real estate. Organizational structures will need to be examined as process complexities would be reduced and overhead diminished. How disruptive will Blockchain be for the banking industry? In a word: Very. The integration of Blockchain into the financial services industry in general, and in banking as a whole, will change everything. More efficient, less expensive, and infinitely more secure access to money, are these are all big promises to deliver on and there’s every reason to look forward to these changes. Going well beyond cryptocurrencies, Blockchain’s potential for changing the landscape of banking cannot be ignored.